Yeah, but: Little wheels even make it easier to open doors. 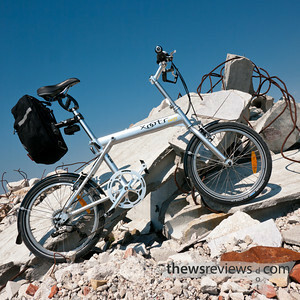 The Long Version: Two years ago I wrote about the Xootr Swift folding bike, and it remains one of the most popular reviews on this website. Now it's time for a follow-up. 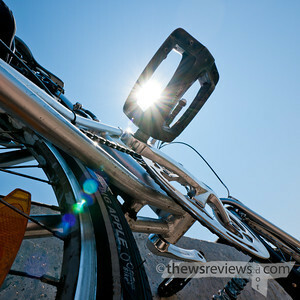 First, a quick recap for those who arrived here directly, and don't want to wade through the original report: the Swift is an apartment-friendly design from New York City that has a simple and strong fold, but at the expense of being larger than just about any folding bike when it's compacted down. Rather than following the British model of a bike that will fit under a seat on the tube, this is a quintessentially American bike that will fit in the boot – trunk – of a mid-sized car. 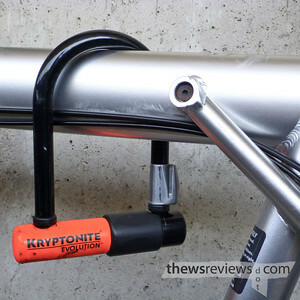 The Swift folds vertically, being split on the seat tube and locked in place by two quick-releases that clamp the seat post in place. It's an exceptional use of the inherent strength of these components, and is both visually and mechanically elegant. The bike comfortably fits sideways in a storage room that's barely wider than its own doorway. Normally the seat post will lock the bike tightly into its folded position, but my Crossrack stops it from dropping far enough down. Instead I just secure the seat tube to the top tube with a reflective ankle strap, which is actually the only time that I need one of those ultra-fashionable accessories. Small wheels mean that the Swift has an unusually large front chain ring, putting the chain too high to snag the cuff of my jeans or my shoelaces, and it even has a built-in guard for good measure. That's a huge win for the Swift. A few things have changed compared to when the bike was new. While the stock brakes on the Swift are decent, I've upgraded to Shimano Deore levers and V-brakes for a significant improvement in stopping power. There's less flex in the system now, making the whole thing crisper and giving me more confidence on the road. Changing the brakes over was easy, and the standard-length cables that the kit came with were ample. I've also swapped out the stock pedals for bigger platforms. I bike wearing soft shoes – inefficient but practical – and these BMX-style pedals are more comfortable and, to my eye, look better. They're nothing fancy, being about the cheapest ones that MEC sells, but if I was looking for ways to drop weight and improve performance my bike wouldn't be the one with the most work to do. Other minor positioning and accessory refinements mean that the bike suits me even better now than it did when it was brand new. But the biggest change is that I've replaced the stock Kenda Swift tires with Schwalbe Big Apples. 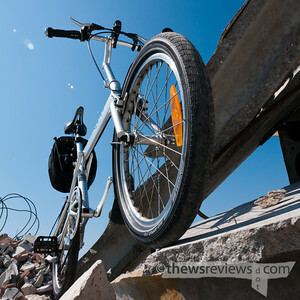 These tires are relatively famous, and really change the personality of the bike. 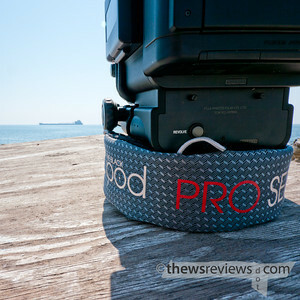 I've split off my experience with them into a separate review here. During the riding season my Swift stays out on the balcony, and I have to admit that I don't pamper it. Two years have left rust on the bolt of the quick release that holds the handlebar riser in place, as well as faint hints of rust on the riser itself. The chain shows some rust, as chains will do, but the other quick releases are clean. There was also some rust on the curved brake cable guides, the part right above the brakes themselves, but those are gone now. Aside from that there are a few more nicks and scratches on the frame, and the half-grip on the right side of the handlebar needs to be snugged back into place occasionally. I could just fix that with some cheap hairspray, but now I keep it in place with a bar-end bell instead. And that's it – aside from those very minor instances of wear-and-tear, the bike is just as solid as it was when it was brand new. 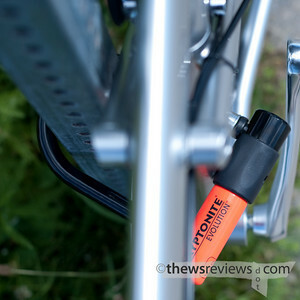 There's no new wiggle, no extra flex, no movement in the frame pivot and no creaks or rattles. I fell in love with the Swift as soon as I took it out on the streets, and I'm still just as happy with it after these two years. Last summer I had a delusional episode and considered switching to skinny tires and clip-on bars, because I have no doubt that some lighter components could make the Swift into a respectable racer. I'm nowhere near fit or dedicated enough to pull that off, but it's nice to know that it's possible. For the bike, at least. As for me, I'm perfectly happy with having a tough and versatile commuter bike that I can have some fun with on the weekends. After two years I still have to give the Swift a perfect score, which is something I almost never do. 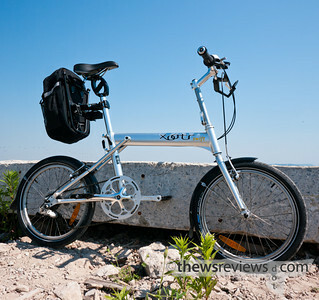 In a world of compromises and design decisions, I really can't see how Xootr could have made a better bike for less money. 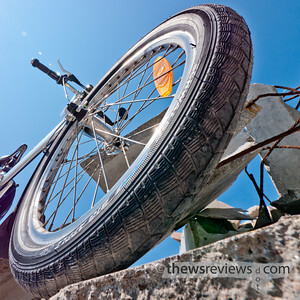 The usual caveat of making sure that it's the right choice for the purpose remains: it's a small-wheeled bike that folds down a little, instead of being a cubic foot of components that latch together into something ridable. But aside from that, I'd recommend the Swift for anyone who's looking for a folder, or even for anyone who just wants a great all-purpose urban bike. I'm looking forward to many more happy years with mine. Yeah, but: Make sure they fit. 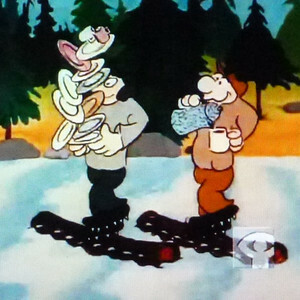 The Long Version: If the way to a man's heart is through his stomach, then the way to a bike's personality is through its sneakers. 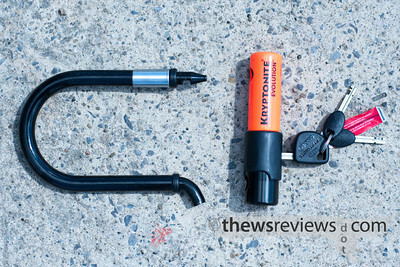 The stock Xootr Swift comes with a set of Kenda Kwest tires that are good all-around performers, which makes for a sprightly bike that's comfortable to ride. Narrower tires that run at a higher pressure will make the Swift into a little racer, while bigger tires have a tremendous ability to absorb bumps. 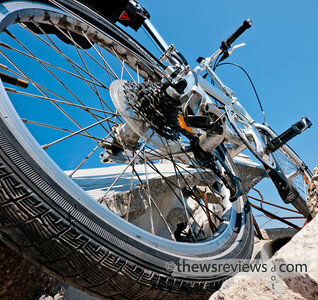 Schwalbe's Big Apple tires are definitely in the second category. I put them on my bike a month ago, and the difference is amazing. I'm just disappointed that nobody else noticed how it makes the Swift look much tougher. Having the big Big Apples on my bike has slowed it down; conversely, it makes me work harder to go not-quite-as-fast. But on hard-packed trails and bad pavement the difference is huge: much better shock absorption and a general sense of sure-footedness that I didn't have with the skinnier tires. It's also more stable when rolling at slow speeds, letting me stay on the bike and in control when other cyclists are putting their feet down. I don't know if that's because of their width or their not inconsiderable weight, but they're almost as good as doing a track-stand without the need for all of that pesky balancing. 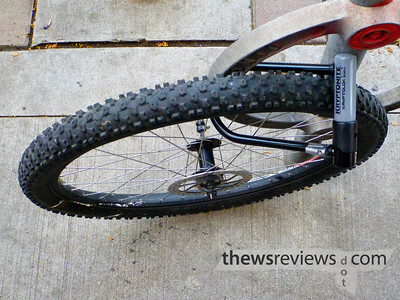 The Big Apple tires for the Xootr Swift are 2" across, which is considerably bigger than the 1.5" of the stock Kwests. The front fork has no problem with the added size, but not all Swifts are going to be happy with something this big in the rear. Mine has taken some coaxing to make it work properly, but fortunately the horizontal dropouts let the entire rear wheel move back a half-inch or so. That has given me the extra clearance that I need, even though it hasn't made the derailleur all that happy. Buy the Big Apple through a dealer with a good return policy, and make sure you try it on the back of the Swift before opening both packages. The other consideration with the Big Apples is that they should use different inner tubes from the ones that came with the bike. I have to admit that I managed to irreparably puncture one of my new bigger tubes during installation, so the front wheel is using the undersized original one with no ill effects. I inflate the rear tire to its maximum of 70psi, but leave the front at 60psi or so. When I eventually replace the tube with the proper size I may increase the pressure, but its current setup gives better shock absorption. After all, I didn't pick these tires for their speed. Finally, I really like that the Big Apples have reflective rings on their sidewalls. 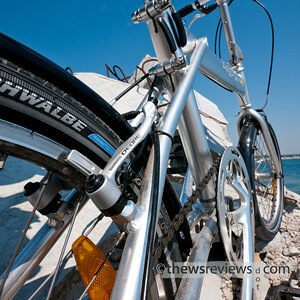 It's almost as if Schwalbe knew that they were going to be put on a bike – a nice touch and a good design. A little update: it's been over six months since I put the Big Apples on my Swift, and I remain completely happy with them. I'm not usually a winter cyclist, but I have biked through a snow storm with these tires. I deflated them somewhat – still well within their generous pressure range – and took it easy when I was playing in traffic, but I just tend to be cautious when drivers aren't expecting bikes to be out. Yes, I did lock up my back wheel once, which is pretty minor, but I couldn't break traction by accelerating no matter how hard I cranked. Not that I'm particularly strong, but it was still enough to impress me. 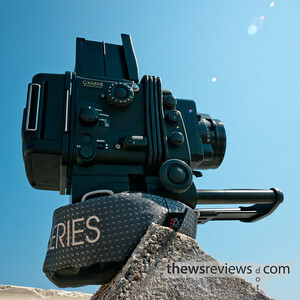 Yeah, but: Just as useful as the yellow one - but for much bigger cameras. The Long Version: Sometimes I'm my own worst enemy. When I write a review I can talk myself into something that might not otherwise occur to me. It happened with a flashlight, and it happened with the Yellow Pod. The Pod (dot ca) makes beanbag camera supports that are a little different from the usual lumpy bags, and after spending time with their smallest one under my little Hasselblad, I started to think about how useful their biggest one would be for my big Fuji. Five and a half months later I bought it. 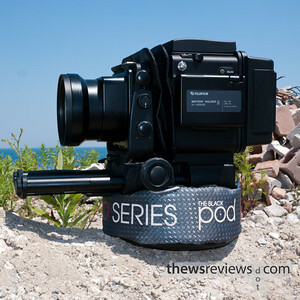 The Black Pod is the largest model, and has a centred 1/4" camera mounting screw. (The Silver model is the same size, but with an off-centre mount, making it better for SLRs with long lenses.) It's about eight inches across and three inches high, and it weights better than two and a half pounds. 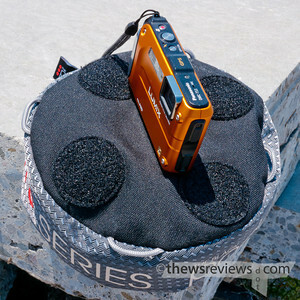 It has velcro pads on the mounting surface, and includes little velcro 'buttons' to match, as well as four lash points. Those look a lot like shoelaces, but I'm sure they're much fancier than that. I picked up the Black pod so that I can use impromptu support instead of carrying a massive tripod. 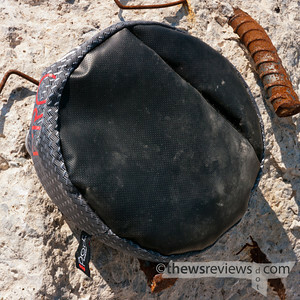 When it won't fit inside my backpack it can be clipped to the outside via its lash points, and its squishiness makes it easy to fit inside my bike pannier. It's certainly not small, but any equipment that needs it will also be big enough to keep it in perspective. My Black Pod's first outing was to the Leslie Street Spit, which is a combination nature reserve and construction landfill site. Naturally, I head to the side with the old power poles and rebar. I'm pleased to say that the day of perching on broken bricks and concrete slabs left its tough base dirty but undamaged. Shifting the camera into position with the black pod is easier than it is with the little yellow one, and while I occasionally missed having my tripods' ability to pick and choose my position, I wouldn't have wanted to carry one instead. The proof of anything photographic is in the photos, and the Black pod is absolutely able to hold such a big camera. I can see crisp details in the scanned negatives that I never noticed when I was taking the photos. I did use good photographic hygiene – the day was bright enough that I kept the shutter speed at 1/125 or 1/250 (at f/22 or f/32) and used the mirror lock-up most of the time. Something as supportive as the Black Pod shouldn't have any problems with that, and now I'm looking forward to seeing just how far I can push it. Yeah, but: They do write it in all-caps. The Long Version: It's a common enough mistake, but it drives me nuts just the same: "ISO" does not stand for 'International Standards Organization': it doesn't stand for anything. It's not an acronym. Because "International Organization for Standardization" would have different acronyms in different languages, its founders decided to give it also a short, all-purpose name. 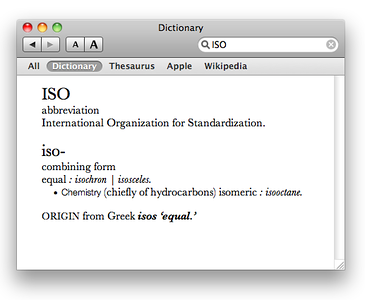 They chose "ISO", derived from the Greek isos, meaning "equal". Attentive readers will also notice that the NGO's name, in English, is 'International Organization for Standardization'. Not 'International Standards Organization'. Sure, there are some excellent backronyms out there, but this isn't one of them. The great thing is that pronouncing "iso" as a word – as in isotope, isolated, isochromatic, isotoner – is easier than saying "Eye-Ess-Oh". The chance to be simultaneously pedantic and lazy is a rare and special opportunity. Don't waste it. Yeah, but: The word is "birling". The Long Version: There are a few things that always make me feel Canadian: American attitudes towards firearms, their Republian party, and my fond memories of the Canadian Broadcasting Corporation. 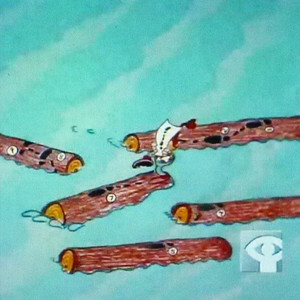 When I was a kid in the `80's, CBC-TV would play the Log Driver's Waltz, a short film from the National Film Board, in between my saturday morning cartoons. I loved it then, and still smile when I see it today. Watch it on the NFB's web site here. Seeing it now – as an adult – I have a better appreciation for its opening cheekiness, and I wonder what sort of reaction it received in 1979. ('If you ask any girl … what pleases her most from her head to her toes, she'll say "I'm not sure that it's business of yours…') The now-classic animation is playful and fun, and I can't imagine any way that the latest computer technology would make it any better. Something that would benefit from modern technology is the NFB's store; they sell their collection on DVD instead of allowing digital downloads. I'd happy buy a high-resolution digital copy even though it's streamed for free, but I just can't bring myself to pay the premium for yet another plastic disk. Instead I've had to make do with downloading just the song by Kate and Anna McGarrigle, which is good but not quite the same thing.